Great for cleaning kennels and crates. 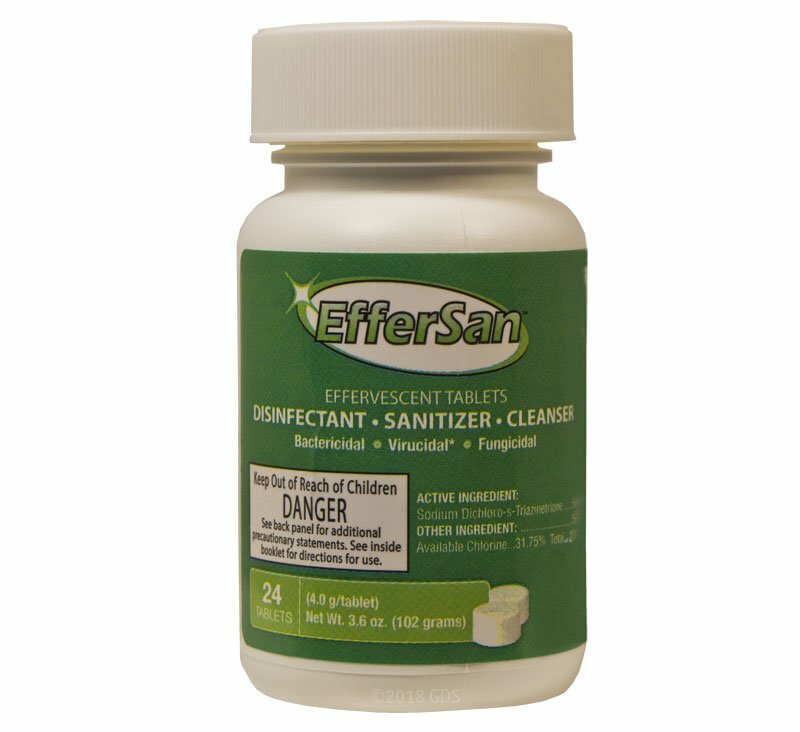 EfferSan is a no-rinse sanitizer that is great for cleaning kennels and crates. EfferSan's subtle chlorine scent lets you know that this product deep cleans without overwhelming you or your dog's senses. EfferSan is safe, simple to use, and can be applied directly to hard surfaces without fading or whitening. Also available in a 100-count size. 1. Prepare a 100 ppm solution by filling a 3-gallon container with fresh, potable water and adding one EfferSan tablet. Allow tablet to dissolve completely before using solution to fill a 32 oz. spray bottle or bucket. 2. Spray surface to be sanitized and allow to remain wet for 1 minute. EfferSan is a no-rinse sanitizer that can air dry. 1. Prepare a 1,300 ppm solution by filling a 32 oz. spray bottle with fresh, potable water and adding one EfferSan tablet. Allow tablet to dissolve completely. 2. Clean surface and then apply the solution with a mop, cloth, sponge, brush, foaming equipment or coarse trigger sprayer. 3. Allow surface to remain wet for 5 minutes. Rinse thoroughly and allow to air dry. 4. Prepare a fresh solution daily or when it becomes soiled or diluted. All treated equipment that will contact food, feed, or drinking water must be rinsed with potable water before reuse. EfferSan Safety Sheet, downloadable in .pdf format. Click here to read the EfferSan Safety Sheet. EfferSan Dilution Chart, downloadable in .pdf format. Click here to read the EfferSan Dilution Chart. 1. Do I need to mix the solution? 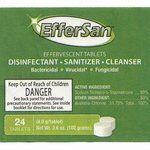 No, EfferSan is an effervescent tablet, meaning that it dissolves on its own. No mixing or stirring required. 2. How long do tablets remain stable once I add water? EfferSan remains stable for two weeks once diluted in water. The tablets themselves are good for up to three years in tablet form. 3. How long do I have to wait for tablets to dissolve in water? EfferSan tablets dissolve within 5-7 minutes. The warmer the water, the faster they dissolve. 4. What type of water do I use with tablets? Any potable water (hard, soft, hot, or cold) is great for EfferSan tablets. 5. Does EfferSan serve as a detergent/degreaser as well as sanitizer? No, it's just a sanitizer and disinfectant. 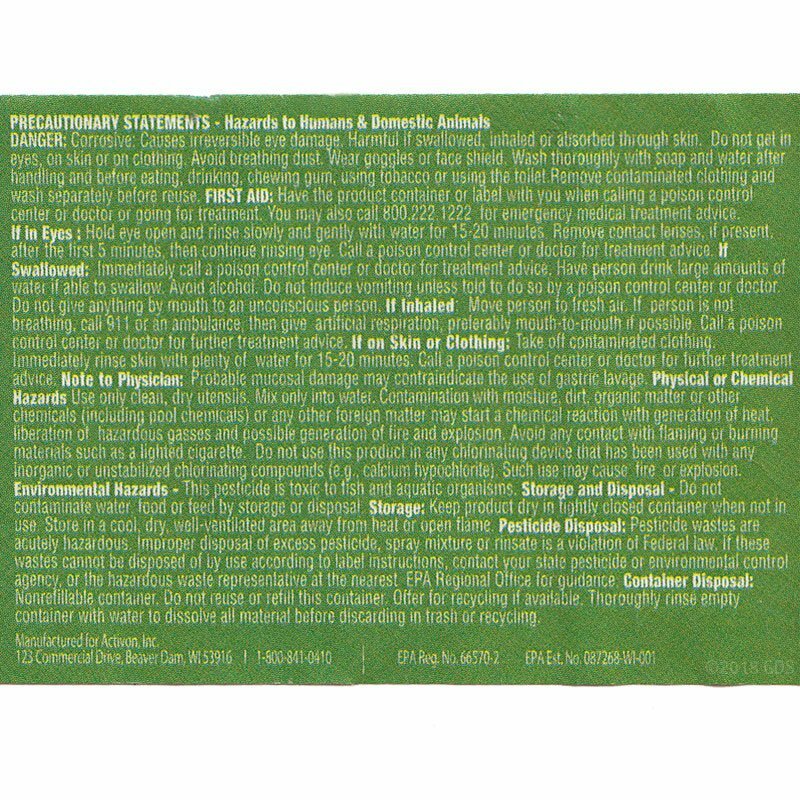 We always recommend cleaning/degreasing to remove the organic matter prior to sanitizing. 6. 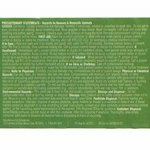 Must Effersan be rinsed after being applied or may the surface be left to dry and then be used? It depends on if you are using it as a sanitizer or disinfectant. If used as a disinfectant it does need to be rinsed. As a sanitizer, it does not need to be rinsed. 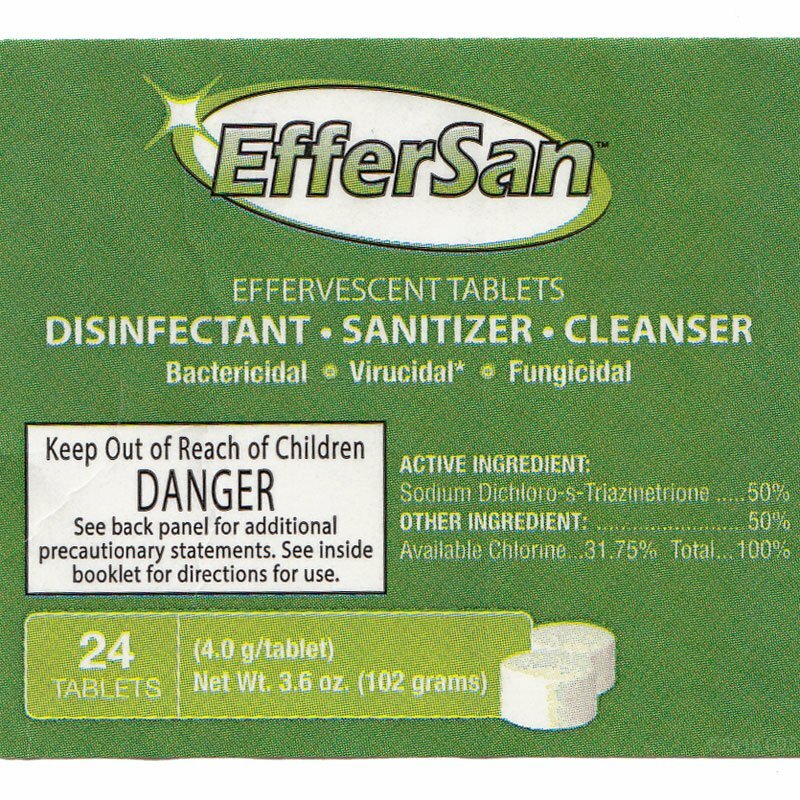 EfferSan is a no-rinse sanitizer that can air dry. All treated equipment that will contact food, feed, or drinking water must be rinsed with potable water before reuse. 7. Does light affect the efficacy of EfferSan once mixed with water? We always recommend storing EfferSan in a closet or out of direct sunlight. Sunlight will decrease the stability of the product but only by a day or two.